I am embarking on a grand experiment entitled “Houseplants and the Possibly Detrimental Effects of My Brown Thumb on Succulents.” Okay, so keeping houseplants may not seem like a big endeavor to most of you, but for me it is. I cannot keep houseplants alive. Can. Not. I have killed every houseplant I have ever owned – including a bamboo plant. The plants I grow outdoors at least have a fighting chance at survival, although survival is not guaranteed. I once killed a dill weed plant that I was growing outside. Think about that for a minute. I have wanted to buy some succulents for a while, but I was worried that with my past track record I would just be throwing money down the drain. But, nothing ventured, nothing gained, right? So, I sucked it up and bought a few. Let the great experiment begin! I loved the color and shape of this Senecia or “Blue Chalk Fingers” succulent. It looks as if it has already bloomed for the year, and I don’t know if they bloom more than once. The blue color of the plant itself is almost as pretty as a flower anyway! 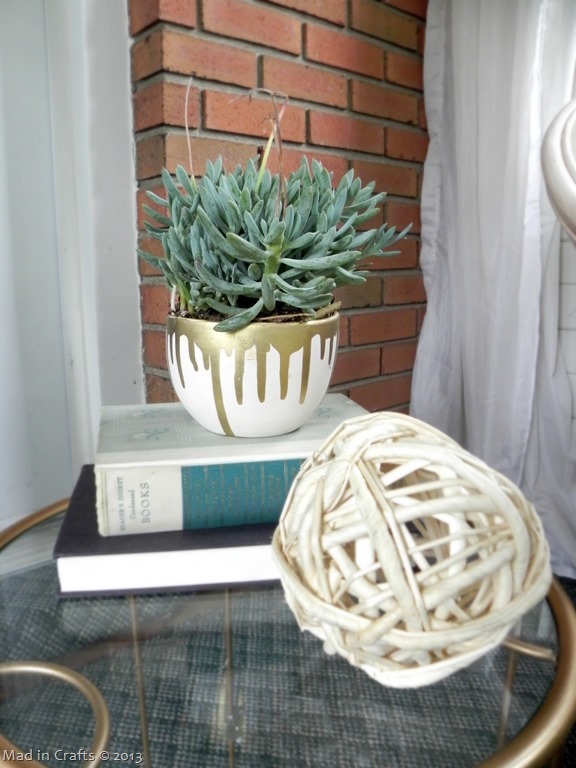 I potted the succulent in a pottery bowl from Goodwill (which was originally from Target). 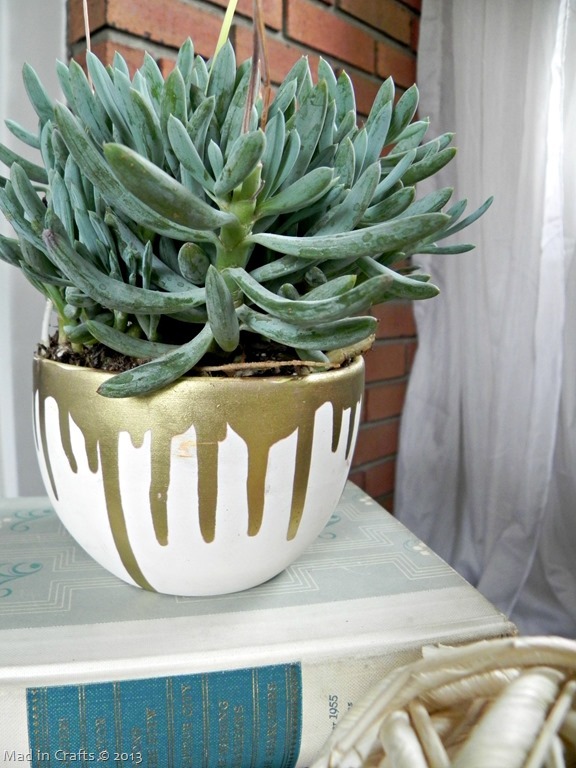 I used some of my Martha Stewart brass gilding to create the drips down the side of the bowl. I like the way that the shapes of the drips reference the shape of the chalk fingers too!. 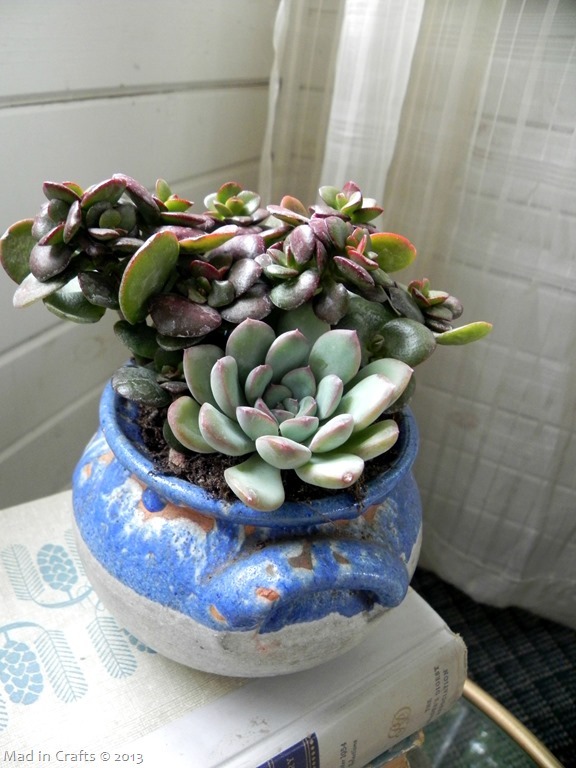 I planted an Echeveria pulidonis or “Hens and Chicks” and a Crassula ovata ‘Compactum’ or “Mini Jade” in a small crock, also from Goodwill. Succulents have such pretty variations in their colors, and my reading tells me that the colors will change slightly throughout the year. I might be getting ahead of myself, but I am hoping that these plants grow well enough that I will be able to propagate them next year. 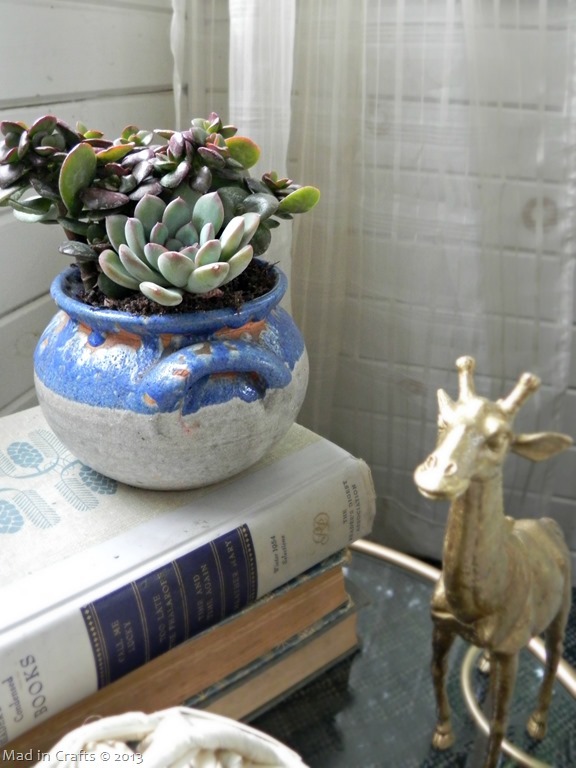 With succulents, you just need to make a cutting of the plant, let it dry for a few days, and then set it in some soil. The cutting will send roots out into the soil and make a new plant! Cool, right? I found this really helpful Instructables article by user MrBrownThumb that I have pinned for next year. I will keep you posted on the continuing results of my houseplant experiment. 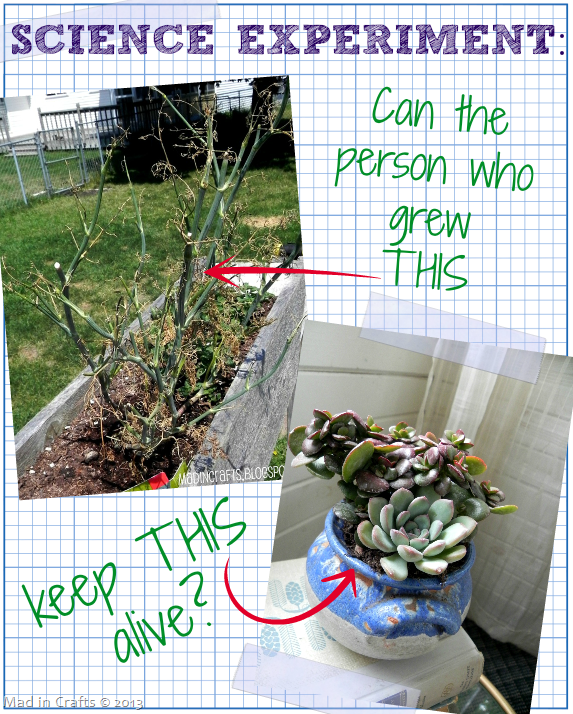 Hopefully my plant-killing history won’t repeat itself! Do you have any succulent-growing wisdom? I would love to hear your advice in the comments!